Background: Readmissions following acute myocardial infarction (AMI) are costly and may be partly due to poor care. A previous systematic review examined the literature through 2007. Since then, health policy has changed and additional articles examining predictors of readmission have appeared. We sought to conduct a systematic review of the literature after 2007 regarding socio-demographic, clinical, psychosocial, and hospital level predictors of 30-day readmissions after acute coronary syndrome. Methods: A systematic search of the literature using Pubmed, OVID, ISI web of science, CINAHL, ACP and the Cochrane Library was conducted, including a quality assessment using Downs and Black criteria. Articles reporting on 30-day readmission rate and examining at least one patient-level predictor of readmission at 30 days were included; articles examining interventions to reduce readmissions were excluded. Results: Twenty-two studies were included in this review from which more than 60 predictors of 30-day readmission were identified. Age, co-morbidity, COPD, diabetes, hypertension and having had a previous AMI were all consistently associated with higher risk of readmission. 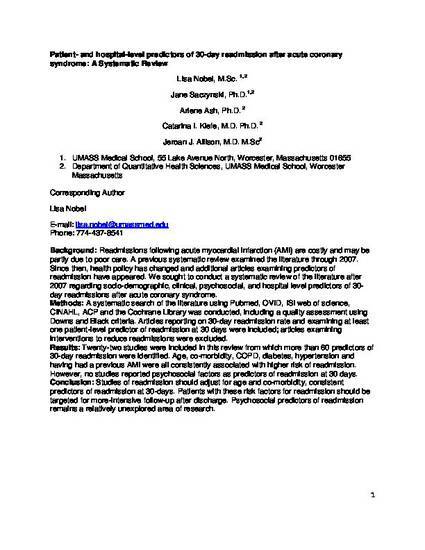 However, no studies reported psychosocial factors as predictors of readmission at 30 days. Conclusion: Studies of readmission should adjust for age and co-morbidity, consistent predictors of readmission at 30-days. Patients with these risk factors for readmission should be targeted for more-intensive follow-up after discharge. Psychosocial predictors of readmission remains a relatively unexplored area of research.